With a private transfer included in this tour, it’s completely tension free to visit the world’s first wildlife park centered on river habitats. You’ll get to discover 6000 plus residents including rare exotic freshwater marine animals in this approximately 30-acre park. Look out for its distinct themed sections based on the world’s popular rivers like Amazon, Congo, Ganges, Mary, Mekong, Mississippi, and Yangtze. Apart from rare and endangered aquatic species like Giant Salamander, River Safari is also home to red pandas and giant pandas. Before the trip ends, you can dine at one of its restaurants and also experience the thrilling Amazon River Quest Boat Ride. We’ve designed this five-night retreat with the most exclusive and intimate experiences, making it the ultimate getaway for newlyweds, lovebirds, and of course, anyone romantic at heart. 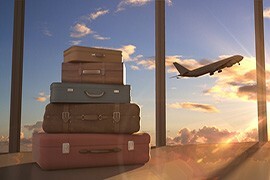 As your accommodation, airport transfers, and activities are immaculately pre-arranged, this allows you both to easily do away with all disruptions and give complete attention to each other. A guided city tour of the city-state’s main attractions provides the perfect start to your Romantic Holidays Singapore. 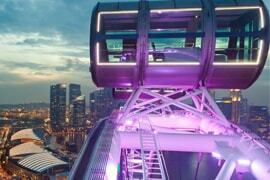 As part of your sightseeing, you’ll get to revel in a dreamy spin above the stunning sights of the region, thanks to a ride in Singapore Flyer – the Asia’s biggest observation wheel. You can also look forward to some exciting wildlife experiences during your holiday and the best thing is that they all come with private dining experience. 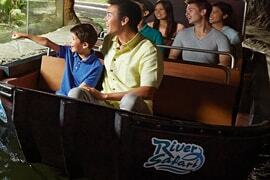 A trip to River Safari, for instance, not only lets you discover the world’s most popular river habitats and enjoy a thrilling boat ride but also savor sumptuous lunch at one of its restaurants. Alternatively, with your Singapore Zoo visit, gear up for an unforgettable breakfast experience with friendly orangutans. Best of all, you’ll have a full day at your disposal to shop, dine and explore the main city sights on your own. When I got engaged to my long time girlfriend, we went on a romantic holiday to Singapore to celebrate our engagement. Both of us are outdoor people and love nature, hence this package seemed apt for us. The tours that we really loved were River Safari and Jurong Bird Park. The best part was that we got to have lunch and breakfast, respectively at the parks. It was a unique and amazing experience. We look forward to visiting Singapore again soon! We had really romantic trip to Singapore! It had been a long time I and my husband had not taken a romantic holiday. This tour package seemed quite interesting, something that we both would like. We really enjoyed the jungle breakfast at the zoo as we both love nature and animals. The Singapore city tour was also great as all the major landmarks and places were included in the itinerary. The entire tour went well, without any issues, thanks to the meticulous planning done by Rayna Tours.